WPNewsman can send emails through any third party SMTP server. 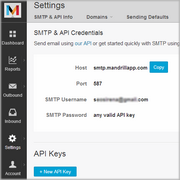 In addition, you can use the SMTP settings of any email sender provider such as Amazon SES, SendGrid, Mandrill, etc. in our plugin. This article explains you how to setup WPNewsman and Mandrill to send your email newsletters in style. The tutorial assumes that you have already installed and activated the WPNewsman plugin on your WordPress site. Login to your WordPress dashboard and go to WPNewsman -> Settings -> Delivery Settings. Check the "Use custom SMTP server" option. Enter an email address in the "Test your settings" field to test the SMTP settings. If you receive a test email from WPNewsman, everything is good and you are done. If not, double check if your settings are correct.